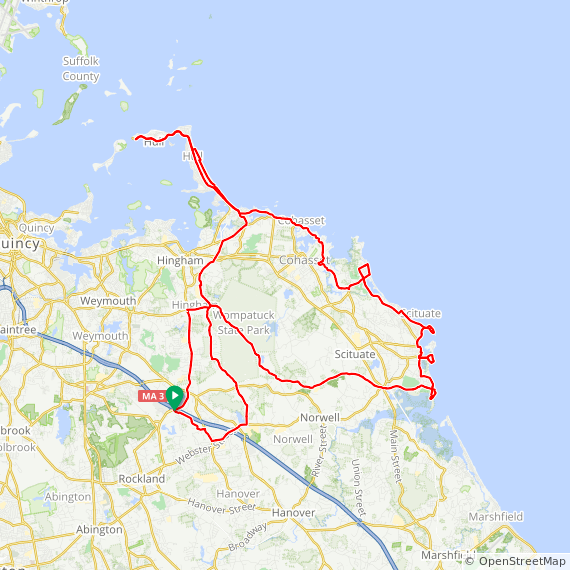 This ride combines shady, quiet roads, scenic harbors, historic lighthouses, windmills, beaches and beautiful vistas and occurs on some the most spectacular coastline on the South Shore. You'll find that the effort to get up early enough to leave promptly at 7:30 will be paid back by having a great ride with little traffic. Because we start early, you'll be home in time to cook omelets for Sunday brunch! The SSCL will take place every week, weather permitting. 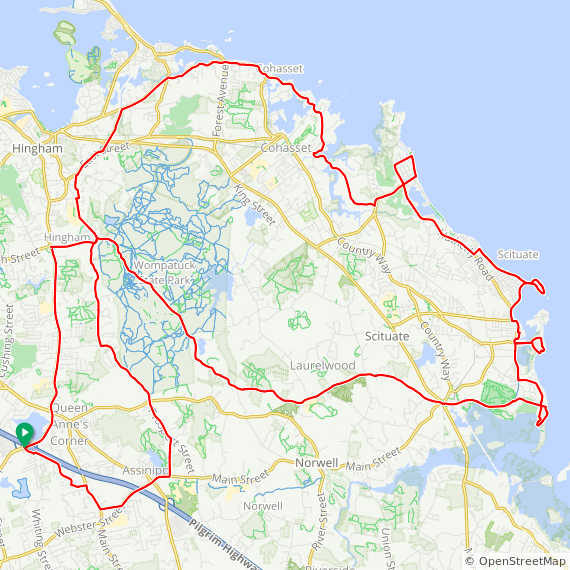 The 45-mile loop includes Rockland, Hingham, Norwell, Scituate, and Cohasset with a coffee stop in Scituate Harbor. The 57-mile ride adds Pemberton Point in Hull, with its magnificent views of Boston Harbor from under the windmill! Set your alarm. You'll be happy you did. The ride has a Facebook page. Like it, if you want more updates. Directions: Take 128 or 93 to Route 3 to Exit 14 (Rt. 228) in Rockland. Turn left at the end of the ramp then left again at the first set of lights, and park in the Park'n'Ride lot. Space Unlimited. Repeats every week every Sunday until Sun Oct 13 2019 except Sun Jun 23 2019. Take 128 or 93 to Route 3 to Exit 14 (Rt. 228) in Rockland. Turn left at the end of the ramp, then left again at the first set of lights, and park in the Park'n'Ride lot. Space unlimited. Please check the website Saturday after 9:30 PM for last minute cancellations. If the weather is iffy, please check in at 6 AM Sunday morning to see if the ride is on.